This article is about an office tool or handtool for sheet materials. For the industrial drilling of holes through many sheets of paper, see Paper drilling. "Hole punching" redirects here. 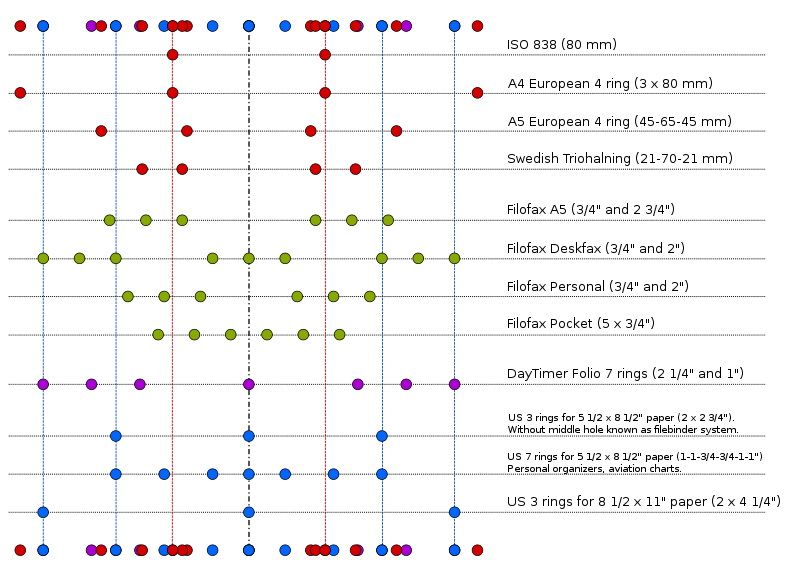 For the technique used in computer networks, see Hole punching (networking). 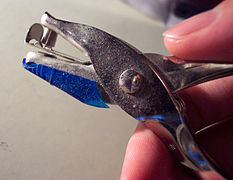 A hole punch (also known as a hole puncher) most commonly refers to an office tool that is used to create holes in sheets of paper, often for the purpose of collecting the sheets in a binder or folder. 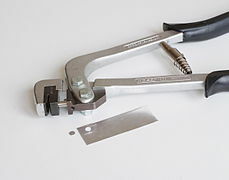 The term can also refer to tools of different construction from one designed for paper, such as a those used for leather goods (generally called a leather punch), for cloth, for thin plastic sheeting, and for variations of sheet metal, such as aluminum siding or metal air ducts. 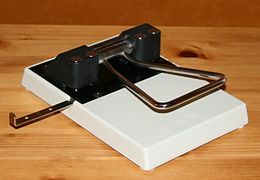 A typical hole punch, whether a single or multiple hole punch, has a long lever which is used to push a bladed cylinder, the punch, straight through one or more sheets of paper and then through a close fitting hole in the die. As the vertical travel distance of the cylinder is only a few millimeters, it can be positioned within a centimeter of the lever fulcrum. 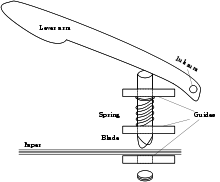 For low volume hole punches, the resulting lever need not be more than 8 centimetres (3.1 in) for sufficient force. Two paper guides are needed to line up the paper: one opposite where the paper is inserted, to set the margin distance, and one on an adjacent side. Hole punches for industrial volumes (hundreds of sheets) feature very long lever arms, but function identically. 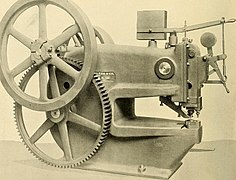 Another mechanism uses hollowed drills which are lowered by a screwing action into the paper. The paper is cut and forced up into the shaft of the drill to be later discarded as tightly packed columns of waste paper. This method allows a small machine to cut industrial volumes of paper with little effort. The most common standard dimension and location of filing holes punched in paper is International Standard ISO 838. Two holes with a diameter of 6±0.5 mm are punched into the paper. The centers of these holes are 80±0.5 mm apart and have a distance of 12±1 mm to the nearest edge of the paper. The holes are located symmetrically in relation to the axis of the sheet or document. Any paper format that is at least 100 mm high (e.g. ISO A7 and larger) can be filed using this system. A printed document with a margin of 20–25 mm will accommodate ISO 838 filing holes. A four-hole extension is also commonly used. The two middle holes are punched in accordance with ISO 838, and so paper punched with the four holes can be filed in binders that are consistent with ISO 838. The two additional holes are located 80 mm above and below these. The use of two additional holes provides more stability. This extension is sometimes referred to as the "888" system, because of the three 8-cm gaps between the holes. Some 2-hole punches have an "888" marking on their paper guide, to assist punching all four holes into A4 paper. For USA Legal Size paper format [8½ by 14 inches (215 by 356 mm)] traditionally 4 holes has been used in the past and still in use today but not as common as its sibling the standard 3 holes (see below). The 4 holes are preferred due to the extra-long length of 14-inch side of the paper where the 4 holes would be placed. Binders with 4 rings gives the paper better support in the binder. Were the documents only punched with 3 holes, this would allow sagging of the paper at the top part of the binder above the top ring. The 4 holes are positioned symmetrically with centers 3.5 inches (89 mm) apart. In regions that use the US Letter paper format [8½ by 11 inches (215 by 280 mm)]; United States, Canada, and in part Mexico and the Philippines), a three-hole standard is widely used. The holes are positioned symmetrically, with the centers 4.25 inches (108 mm) apart. The diameter of the holes varies between manufacturers, with typical values being 1⁄4 to 5⁄16 inch (6.4 to 7.9 mm). The 5/16 value is most commonly used, as it allows for looser tolerances in both ring binder and paper punching. The distance of the hole center to the paper edge also varies, with 1⁄2 inch (13 mm) being a typical value. Unlike ISO 838, this 3-hole system appears to have no well-established official specification, and is a de facto standard established by custom and tradition. It can only be applied to paper formats that are at least 9.5 inches (240 mm) high. 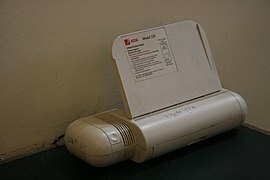 Another standard also occasionally used in the US is a "filebinder" system. Its two holes are positioned symmetrically, with the centers 2.75 inches (70 mm) apart. In Sweden, a four-hole national standard is almost exclusively used. The centers of the holes are 21 mm, 70 mm and 21 mm apart. The guides help keep the paper in a straight line. The official name of this four-hole system is triohålning, since it was adapted to the "Trio binder" which was awarded Swedish patent in 1890. The binder's inventor, Andreas Tengwall, supposedly named it after a consortium consisting of himself and two companions, i.e. a trio. The binder can be opened at any place while holding the papers in place, as the inner holes have guide pins from one side, the outer holes have pins from the other side. Single hole punches are often used to punch a ticket, which indicates it has been used, or to make confetti when creating scrapbooks and other paper crafts. For applications needing a variety of hole shapes, a ticket punch may be used. A single hole punch differs from a ticket punch in having a shorter reach and no choice of hole shape. In the United States, single hole punches are often used to punch holes through playing cards, marking them as "used" or "canceled". This helps cut down on cheating by eliminating any cards that may have been tainted by players. Paper drilling is also popular for this purpose. Single hole punches are widely used in the UK Civil Service where papers are punched with a single hole in the upper left, and secured using a treasury tag. A related office tool is the eyelet punch. This is a single-hole punch which also crimps a metal fastening loop around the hole. It is used to permanently secure a few sheets of paper together which must not be separated or modified. 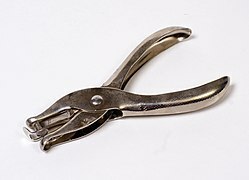 A similar tool, generally known as a holing pincer, is used in animal husbandry. A common application is to attach an ear tag to a livestock animal. 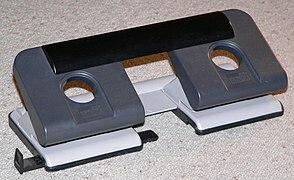 Multiple hole punches typically make between one and eight holes at one time, the placement of which matches the spacing of the rings in a binder. For example, the filofax system uses six holes in two groups of three. In much of the world, two-hole and four-hole punches consistent with ISO 838 are the norm. 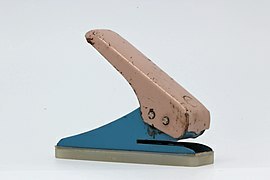 In the US, the three-hole punch is most common. 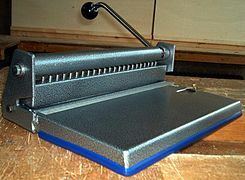 Less frequently seen is the two-hole filebinder punch. In Japan, loose leaf in A4 and JIS B5 sizes (for binders) usually has 30 and 26 holes respectively according to the standard JIS Z 8303 (section 11); which specifies holes of 6±0.5mm of diameter, with their centers every 9.5±1mm, and a distance of 6.5±0.5mm from the center of the holes to the edge of the paper with the additional restriction that the holes must be placed in positions symmetric to the axis across the middle of the page. To prepare documents for comb binding there are special 19-hole punches for letter paper and 23-hole punches for A4 paper. The holes are usually rectangular in shape, to accommodate the plastic binding combs. Specialized punches are also used for the similar but incompatible coil binding process. There are office models available for the perforation of 1 to 150 sheets of paper, and industrial models for up to 470 sheets. Most multiple-hole and many single-hole punches accumulate the waste paper circles (chads) in a chamber, which must be periodically emptied in order to allow the continued operation of the punch. For large stacks of paper, a process of drilling may work better than punching. Paper drills are machines similar to a drill press that use hollow drill bits to drill through stacks of paper. The hollow bit design allows the chads to be ejected during drilling. Paper drills in the United States are most commonly either single-hole or three-hole in construction. 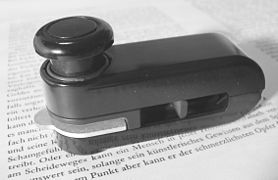 The origins of the hole punch date back to Germany via Matthias Theel, where two early patents for a device designed to "punch holes in paper" have since[when?] been discovered. 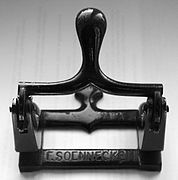 Friedrich Soennecken filed his patent on November 14, 1886, for his Papierlocher für Sammelmappen. 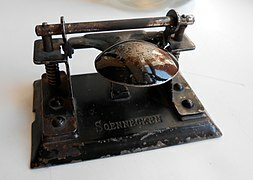 A Google Doodle was used on 14 November 2017 to celebrate the 131st anniversary of the hole punch. ^ "Appletonideas Punch Resources" (PDF). Archived from the original (PDF) on 2013-11-26. Retrieved 2013-02-12. ^ "Poppelsdorf:Soennecken". Archived from the original on 2011-07-19. Retrieved 2008-02-14. ^ Steenks, Gerben (Doodle artist) (14 November 2017). "131st Anniversary of the Hole Puncher". www.google.com. Retrieved 14 November 2017.